"Joaquin Toerres-Garcia: The Arcadian Modern" at the Museum of Modern Art, New York. The exhibition dedicated to the art of Joaquin Torres-Garcia, one of the most complex and iconic modern masters of the first half of the twentieth century, embraces the whole work of art. Drawings, paintings, objects, sculptures and original notebooks of the artist provide insight into his creative journey. 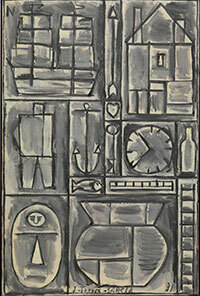 A large part focuses on the 1923-1933 period, when Torres-Garcia participated in various avant-garde movements of European modernism, while establishing his own constructivist signature but also the 1935-1943 period, when he produced one of the most striking directories of synthetic abstraction, when returning from Uruguay.